How to setup Security Code for Credit Card transactions? STEP 2: Move the status to ACTIVE and select the label you wish to display on your booking engine. that the credit card security code will be displayed only once and will be immediately destroyed afterwards. that the credit card security code will be automatically destroyed 15 days after the check-out date even if it was never used before. that YOU WILL NEVER RETAIN SECURITY CODES subsequent to the transaction authorization process. STEP 3: Click on SAVE AND CLOSE, confirm this action by clicking on YES and make sure you get a "success" message. 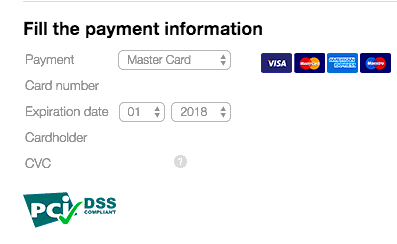 From now on your booking gadget will now display a new field under the payment details section, specific to enter the credit card security code. The CVV field will be available for all credit card types, with the exception of AMERICAN EXPRESS as they do not require CVV for card not present transactions, and they won't charge you more for those transactions either. After collecting the guest's credit card's security code, you will be able to access it only once on your reservations tab. For more details please click here: How can I access client’s credit card details? The credit card security code will be immediately destroyed right after being shown, or 15 days after check out date even if it was never seen.